What happens when an encounter between a man and woman who seem to have nothing in common develops into a complicated love story? Cha Soo Hyun is a woman and daughter of a politician who lives a life where she is unable to choose her own path. After graduating from college, she entered into a loveless marriage with the son to a wealthy conglomerate, a marriage only beneficial to her politican father. After having a child, she was obliged to divorce. Her life is changed when she meets simple and kind Kim Jin Hyuk. Kim Jin Hyuk is ordinary and innocent, a young man who enjoys life and finds happiness in the smaller things. He works various part-time jobs to earn a living, but is looking for a regular job. 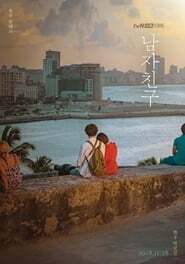 One day, he decides to take a trip abroad, where he meets Cha Soo Hyun.